How to find the center of gravity of a car? What is the physics behind the calculations? 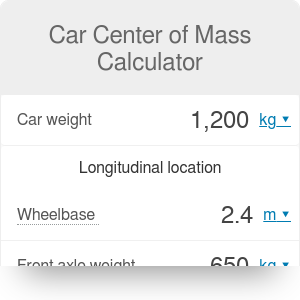 The car center of mass calculator is a handy tool that estimates the location of an essential parameter of your car that can't be determined at first glance - the center of gravity. All you need is a car scale and computations implemented in our car center of gravity calculator. In the following article, you will find a step-by-step instruction of how to find the center of gravity of a car, what is the importance of this quantity (especially race car center of gravity) and what is the physics behind it. side position (determined by distances x and y). Where these three coordinates intersect in space is the actual center of mass. 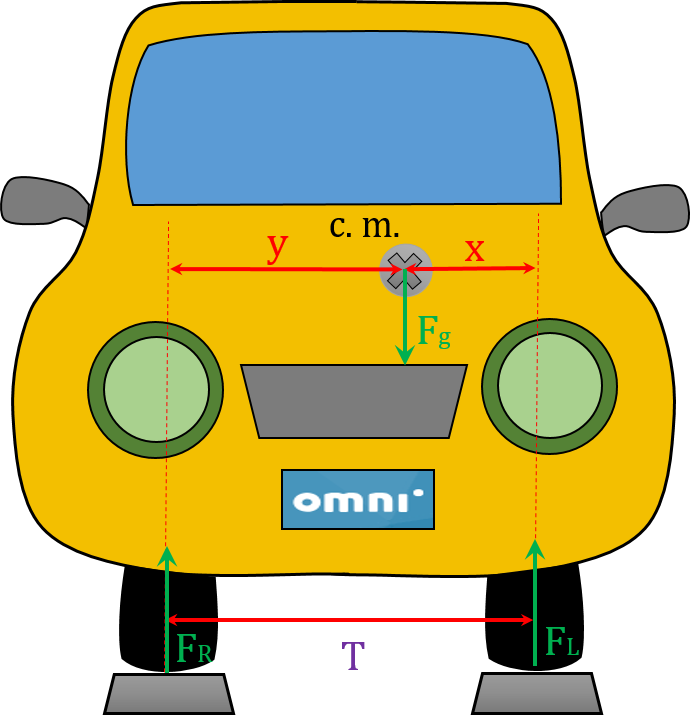 Determination of the center of gravity consists of few weight measurements of the car in different geometries. 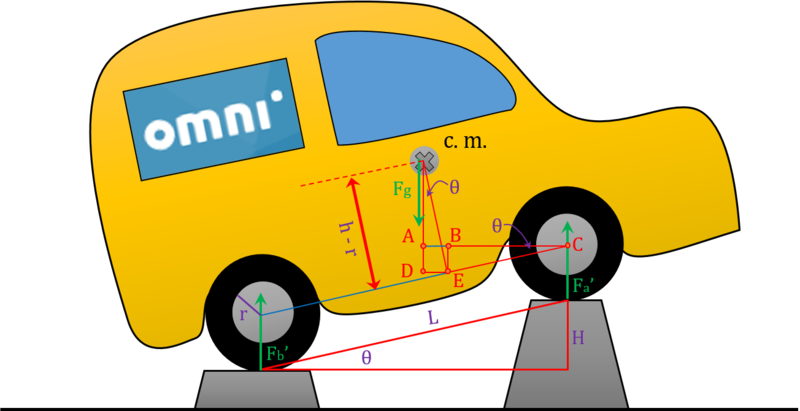 Additionally, you need to measure such parameters as the wheelbase L (distance between the front and rear axles), the radius of the wheels r and the height at which the wheels were raised H in case of altitudinal location, and the car track T in case of side location (distance between the wheels on the same axle). Interested in physics applied to the cars? Don't hesitate and check out our car crash calculator! We explained there how dangerous car crashes can be and how do seatbelts protect you from injury. Enter the weight of your car. For example, 3000 lb. Find the wheelbase of your car - measure the distance between the centers of two wheels of different axles. Let's say it is 8 ft.
Ride up with the front (or rear) wheels on the scale and measure the weight of the front (or rear) axle. Remember that both axles should be on the same level! Therefore, you should place another axle on some platform of the same height as the scale. Measured mass should be approximately two times smaller than the total mass of a car. For example, we've got 1800 lb. Read the resulting distances a and b which determine the longitudinal position of the center of mass. In our example, a = 3.2 ft and b = 4.8 ft. It means that the car center of gravity is slightly moved to the front. It is the most frequent situation because, in almost every car, the engine that is very heavy is placed under the hood in the front. Find the longitudinal position of the center of gravity of your car. You can, of course, use our car center of mass calculator to do it. In our example, we assume that we have the same car as before. Decide which axle will you raise - front or rear. To find the height of the center of mass, you need to lift a little bit one of the axles (like in the figure above). For example, we have lifted front axle. Enter the height at which chosen axle was raised compared to the other axle. The higher you lift the wheels, the more accurate result you will get. However, be careful with doing this - protect your car from sliding from the scale! Always chock the wheels and use the parking brake. The height of 15 inches should be high enough, and this is a value we have used in our example. Enter the radius of the car wheels. In practice, this is a distance from the wheel center (axle) to the ground. In our case, this is 12 in. Measure the weight of the front (or rear) axle. It doesn't matter whether you measure the weight of the raised wheels or the wheels on the ground. The raised axle should weigh slightly less than measured in flat position of a car and the axle on the ground should be a little heavier. In our example, let's say we have weighed the rear wheels and we have obtained 1440 lb. Read the resulting height h which is the height of the center of mass above the ground. In our case, we've got about h = 5 ft.
Find the car track of your car - measure the distance between the centers of two wheels of the same axle. Let's say it is 4 ft.
Ride up with the left (or right) wheels on the scale and measure their weight. Remember that all four wheels should be on the same level! Therefore, you should place another two wheels on some platform of the same height as the scale. Measured mass should be approximately two times smaller than the total mass of a car. For example, we've got a weight of 1550 lb of the left wheels. Read the resulting distances x and y which determine the side position of the center of mass. 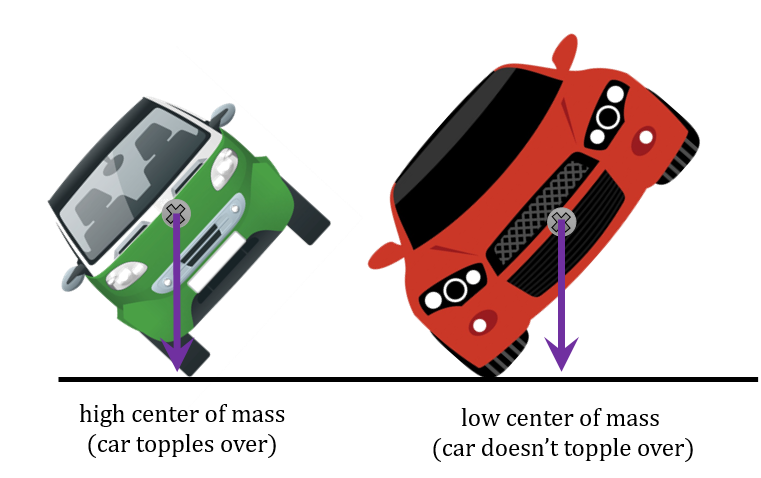 In our example, x ≈ 1.93 ft and y ≈ 2.07 ft. Cars are usually symmetric in weight distribution in the front view and the center of gravity will be approximately in the middle x ≈ y. Before you begin your measurements. Be aware that every baggage (e.g., fire extinguisher) and person inside a car influence the center of mass. Make sure that your tire pressures are set right, and your car is tanked. If you're doing measurements alone, you can use some weights that resemble your weight in the driver seat. The weight distribution is essential in the vehicle handling. It defines the response of the car to the inputs of a driver and how it moves along the road. The race car center of gravity is crucial in balance and steering. 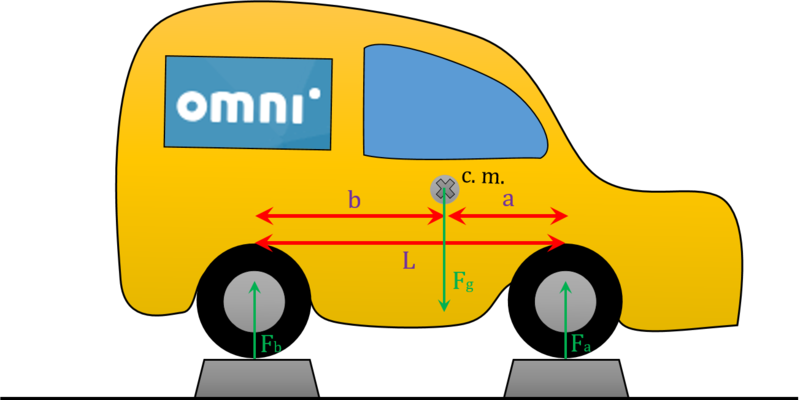 The longitudinal position of the center of mass, related to the wheelbase, determines the load transfer between front and rear wheels. The car will tilt respectively forward and backward during braking and acceleration. On one hand, the vehicle with a much higher weight load on the rear axle tends to understeer - the car does not turn enough and leaves the road. On the other hand, the vehicle turns more sharply than intended and could even get into a spin if there is much greater weight load on the front axle. This situation is called oversteer. In the scheme below, the understeer is presented on the left and oversteer on the right. The altitudinal position of the center of mass, related to the car track, determines the load transfer from side to side. This parameter is important when cornering. The cars with a high altitudinal center of mass will more likely tilt on turning and may even topple. A lower race car's center of gravity is a principal performance advantage, especially compared to the SUVs. Car body of those sports cars is often made of lightweight materials to further lower the center of gravity. This is a reason why Formula One cars are so low (their center of gravity is only about 10 inches high). In the following section, we will try to explain how to derive all the necessary formulas for the car center of mass. At equilibrium, the total force and, more importantly, the total torque acting on an object are equal to zero. This is a starting point to our considerations. Let's suppose that both car axles lie on the weighing scales, like in the figure above. According to the III Newton law of motion, for every action, there is an equal and opposite reaction. That's why there are three forces: gravitational force Fg acting on the center of mass, reaction force Fb acting on the rear axle and reaction force Fa acting on the front axle. where Fb is consequently the weight measured by the scale under the rear axle. There are three similar triangles with the angle θ. They are red in the figure above. The distance |AB| = |DE| = (h - r) * sinθ, where h is the height of the center of mass and r is the radius of a wheel. The distance |BC| = |EC| * sinθ = a * sinθ, where a is the longitudinal position estimated previously. Finally, the distance |AC| = |AB| + |BC| = (h - r) * sinθ + a * sinθ. and in that case Fa - Fa' is the change of weight of the front axle after raising up the front wheels. x = L * (FR / Fg). y = L * (FL / Fg). Now you know how to find the center of gravity of a car. Our car center of mass calculator uses all the above equations and thus simplifies calculations. Just use our tool and find out how quickly it works! Car Center of Mass Calculator can be embedded on your website to enrich the content you wrote and make it easier for your visitors to understand your message.